As a typical post-Weimar German, he believes in strong currency and low inflation. The Financial Times carried an interesting interview with him a few weeks ago,1)Jens Weidmann on Draghi and the ECB, Financial Times 2018-02-23.in which the German financier expressed his opposition to everything that Mario Draghi has stood for in the last few years and made known his wish to stop the quantitative easing program and replace it with raised interest rates. What happens when interest rates increase? If they go up too fast, markets crumble. Low interest rates offered for too long have contributed to the subprime mortgages debacle of 2007-8. In 2012, at the peak of the Eurozone sovereign debt crisis, Draghi promised to do ”whatever it takes” to preserve the European common currency. Weidmann was the only one on the board of the ECB who was opposed to this too. Draghi’s statement had a therapeutic effect on financial markets which quickly calmed down after it. Once he’s gone, however, Weidmann is unlikely to show the same resolve to indeed do whatever it might take to keep the currency together. Finally, just like most Germans, he is not a fan of Emmanuel Macron’s idea of creating a Eurozone budget because the money transfer is seen as too much of a concession towards “lazy Southerners”. Maybe in the end Weidmann will opt to preserve the status-quo, but if he sticks to his beliefs, rates will increase, markets will fall and it’ll be the end of the Eurozone. 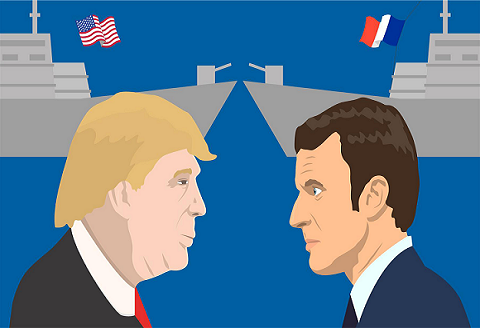 The financial press ridicules the American President and regards his French counterpart as a godsend. Yet, when you look at their hitherto policies, they have been rather similar: less taxation, especially for the rich and restricted immigration. If you look at the results, both economies are experiencing solid growth. Still, it is Macron who is credited for “creating confidence among businesses for his reforms” while Trump’s success is framed as a fluke at best. It might as well be, but the US economic growth is stronger than France’s and the US stock market boom (which began on the night of November 8th 2016 when it became certain that Donald Trump had defeated Hillary Clinton and the market reversed galloping all the way throughout 2017) is a driving factor globally. So, if Mr. Market’s behaviour means anything, then Trump can partly claim credit, Macron can’t. The balance of real strength between Trump and Macron couldn’t have been made clearer. A few days ago Trump signed his tariffs on steel and aluminium into law, and when Macron called him on the matter it was to no avail.2)Readout of President Donald J. Trump’s Call with President Emmanuel Macron of France, White House 2018-03-10.The latter also called on for the WTO to intervene, but the motivation adduced by Trump is “national security” and there is little the WTO or Macron can do about it. 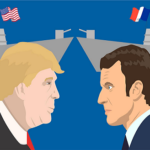 It’s game, set and match for the American president.3)President Trump’s Trade Tariffs Signal A New Global Trade War, Forbes 2018-03-11.Even if the roles had been reversed, the mainstream press would be still praising Macron and mocking Trump. As it is, the French president’s debacle has been rather ignored. Finally, consider what will become of Macron’s reform of the Eurozone and its budget. The latter according to journalist Wolfgang Munchau, who’s generally well informed on the topic, will be a grand total of €3 billion a year, roughly 0.03% of the Eurozone GDP,4)How big will the euro budget be?, Eurointelligence 2018-02-16.so its contribution to the efforts rescuing the losing members of the European common currency from their fate is negligible. Even if Macron has the finance minister of his own choosing and the budget he is calling for, it won’t help. 1. ↑ Jens Weidmann on Draghi and the ECB, Financial Times 2018-02-23. 2. ↑ Readout of President Donald J. Trump’s Call with President Emmanuel Macron of France, White House 2018-03-10. 3. ↑ President Trump’s Trade Tariffs Signal A New Global Trade War, Forbes 2018-03-11. 4. ↑ How big will the euro budget be?, Eurointelligence 2018-02-16. En fait, les USA s’en fichent ! Après avoir fait marcher la planche a billet (quantitative easing) et créé de multiples bulles spéculatives outre-mer, maintenant que les taux d’intérêt sont en hausse aux USA (dépôts plus lucratif, etc..), toute cette finance internationale va se rediriger en investissements aux USA, vers leurs fonds de pension, et vers Wall-Street. Ainsi que comme d’habitude les pétrodollars du Golfe, la moitié au moins des profits des entreprises européennes (Europe colonie US), et via les états américains paradis fiscaux l’argent des mafias, des multinationales US (avantages fiscaux de ces etats), et des dictateurs de part le Monde. In fact, the USA do not care! After running the billboard (quantitative easing) and created multiple speculative bubbles overseas, now that interest rates are rising in the US (more lucrative deposits, etc. ..), all this international finance is going redirecting investments in the US, to their pension funds, and to Wall Street. As usual Gulf petrodollars, at least half of the profits of European companies (European colony US), and via the US tax havens money mafia, multinational US (tax benefits of these states), and dictators from around the world. Trump administration’s emerging trade policy may bar the door to acquisitions by Chinese companies in the U.S.
Macron is a masonic chit president,like all EU politicians,Italy wont leave EU,hopr EU will collapse by itself…sooner better!